Part Used & Method for Pharmaceutical Preparations: After the fruit ripens in summer or autumn, the seeds are gathered and ground into powder. Meridians: Large intestine and small intestine. Functions: 1. To promote urination and regulate abnormal urination; 2. To promote lactation; 3. To moisten intestines and move feces. 1. 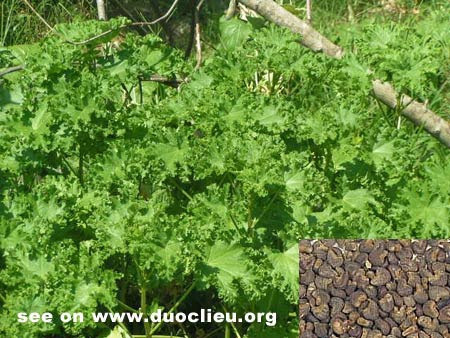 Dysuria and edema: Abutilon (Dongkuizi) is used with Poria (Fuling) and White atractylodes (Baizhu). 2. Scanty urine with blood and painful urination: Abutilon (Dongkuizi) is used with Plantain seed (Cheqianzi), Lygodium spores (Haijinsha) and Talc (Huashi). 3. Obstructed lactation and breast distension: Abutilon (Dongkuizi) is used with Amomum fruit (Sharen) and Ricepaper pith (Tongcao). 4. Constipation: Abutilon (Dongkuizi) is used with herbs that moisten intestines and move feces, such as Chinese angelica root (Danggui), Peach seed (Taoren) and Arborvitae seed (Baiziren).